She followed that advice, and now, at 22, Wences, a junior at North Carolina State University, will soon become the first member of her family to graduate from college. When asked about children, Wences replied that for her, they were years away. As fertility rates across the United States continue to decline — 2017 had the country’s lowest rate since the government started keeping records — some of the largest drops have been among Hispanics. The birthrate for Hispanic women fell by 31 percent from 2007 to 2017, a steep decline that demographers say has been driven in part by generational differences between Hispanic immigrants and their U.S.-born daughters and granddaughters. It is a story of becoming more like other Americans. Nearly two-thirds of Hispanics in the United States today are born in this country, a fact that is often lost in the noisy political battles over immigration. Young U.S.-born Hispanic women are less likely to be poor and more likely to be educated than their immigrant mothers and grandmothers, according to the Pew Research Center, and many are delaying childbearing to finish school and start careers, just like other U.S.-born women. The largest decline in Hispanic fertility rates has been among women of Mexican heritage, Guzman said. That is significant for the nation’s fertility patterns because of the sheer size of the Mexican origin population, which accounts for nearly two-thirds of all Hispanics and around 11 percent of the U.S. population, according to the Pew Research Center. Wences’ parents, who came to the United States permanently in the mid-1990s, met on a tobacco farm and settled in a rural patch of Wake County, which contains Raleigh and its suburbs. Soon after, when her father was 21 and her mother was 23, Wences was born. There weren’t many Hispanic families in the area at the time. Wences recalled spending more time with children who were not Hispanic and discovering differences. Their parents were much older than her parents. They worked at desks, not outside. Wences once bragged to a friend, as they walked on school grounds just before a snowstorm, that her father was the one who sprinkled the salt crunching under their feet. Her father, Enrique, later told her not to talk about his work. Enrique Wences, 43, said he was self-conscious that he did not finish high school. It was a regret that would power him through seven-day workweeks for 25 years so that his daughters could get an education. One of the happiest moments of his life was when Yoselin called him from her car in the parking lot of Wake Technical Community College, where she was studying for an associate degree, to tell him that N.C. State had accepted her transfer application. Wences said that if she got pregnant now, she would probably have to drop out of college. Between 2007 and 2017, the population of Hispanic women of childbearing age in Wake County grew nearly 50 percent, drawn by a booming local economy. Yet the fertility rate for Hispanic women dropped by about 47 percent, according to Johnson. The rate for women who were not Hispanic dropped by about 16 percent in the same period, he said. Birthrates tend to follow economic cycles. The fact that the U.S. rate has not picked up along with the economy in recent years has puzzled demographers. In a survey late last year, the top reasons young women gave for delaying children involved money — children were simply too expensive. “At the moment, I am not thinking about dating anybody,” said Bianca Soria-Avila, 28, who is in her last year at Wake Tech in Raleigh. “I don’t have friends. I don’t want to talk on the phone or to go out. I need to graduate,” she said. 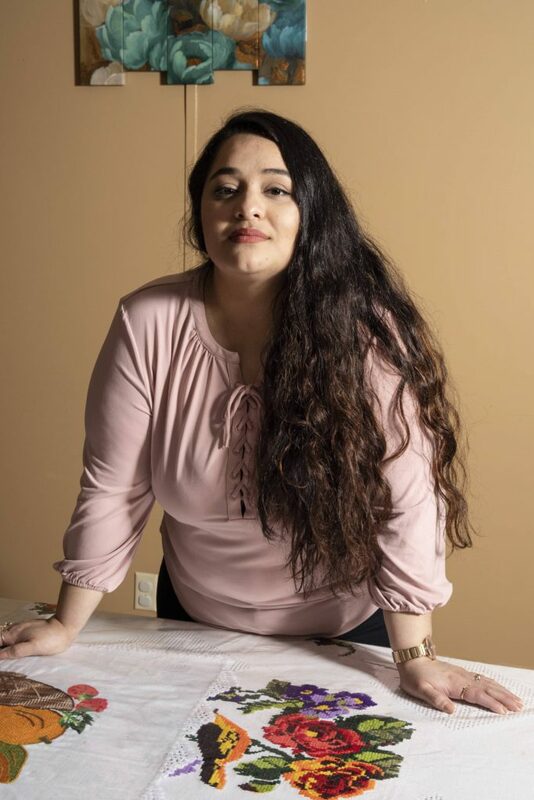 Having children later might be common for young Americans, but it is unusual for Soria-Avila’s older Mexican-American relatives, who often react with raised eyebrows when they ask her age at family gatherings. For now, Wences said she was focused on finishing her bachelor’s degree in psychology. Her associate diploma hangs on her father’s living room wall.